Hot on the heels of the Windows Azure Bootcamp that I did this weekend, I decided that I wanted to do something with Windows Azure, that way I could practice what I had learnt, and begin to increase my exposure to what Windows Azure brings to the table. I decided that I wanted to use the Windows Azure Blob Storage to host all of the static content of my WordPress Blog, thus, _hopefully, _increasing the performance of my blog. What follows is a list of instructions for setting up your WordPress Blog, as well as your Windows Azure account, and also your domain registrar (in order to apply a shortened domain name to your Blob Storage Account). Once you have logged into your Windows Azure account, you will be presented with a huge selection of options, the scope of which are far out with the intention of this blog post, as a result, only the specific options to enable Blob Storage will be discussed here. Using the picture to the below as a guide, first select _Hosted Services, Storage Accounts & CDN, Storage Accounts, _then New Storage Account. 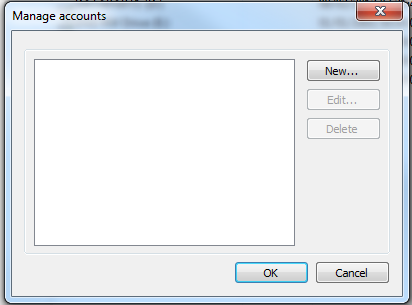 This will open the _Create a New Storage Account_dialog, where you will need to provide the details for the Storage Account that you would like to create. The first of which is the URL that you would like to use. This needs to be unique across the entire Windows Azure infrastructure so you may need to get a little creative with your choice of name. You will be prompted with an error message if you enter something that isn’t allowed. 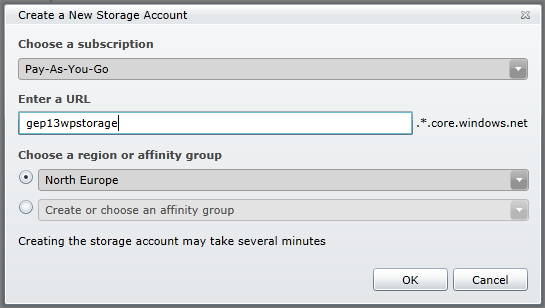 The next piece of information is the region or affinity group that you want your Blob Storage Account to be located. Microsoft has several Data Centers located across the world, including Anywhere US, South Central US, Anywhere Europe, West Europe, Anywhere Asia, Southeast Asia, East Asia, North Central US, North Europe. Simply pick the region that makes most sense to your location. Click OK. Your Storage Account will now get created. There will be a slight delay as your Account is first "Creating..."
But the end result will be your Storage Account will be "Created"
The main ones of interest are the "Keys", which we will use later to connect to the Blob Storage Account from WordPress, and the Blob URL. 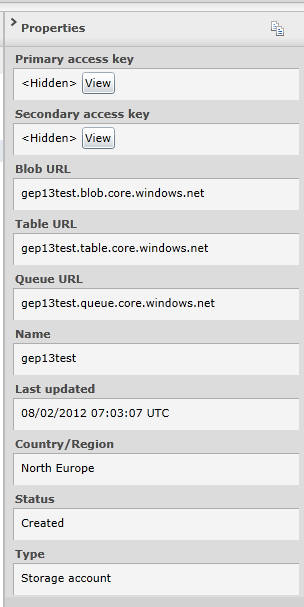 The Blob URL is the publicly routable URL for accessing your Blob Storage account. 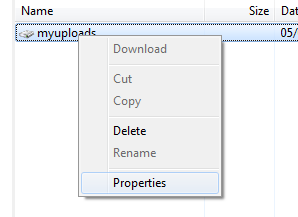 Any files you upload to the Blob Storage Account will be accessible using this URL as a prefix. 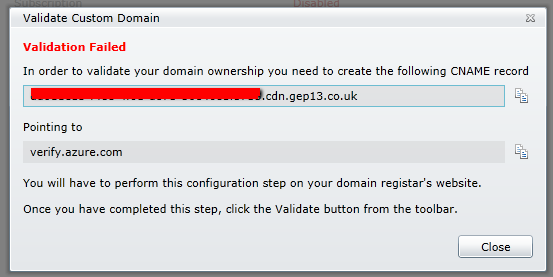 As you can see though, this URL is slightly long, and when used in the context of existing website, say gep13.co.uk, it bears no relation to it. However, this is something we can change by applying a Custom Domain to the Storage Account. At this point, you might want to jump to Step 11. If you do, don’t worry, this simply means that the DNS Settings haven’t finished propagating, so try again later. This is a redirect from the Custom Domain Name that you created, to the Blob URL for your storage account that was highlighted in Step 5 above. In order to say time, you might want to think about creating this CNAME record at the same time as you create the verify CNAME, that way you won’t have to wait a second lot of propagation time. Now that the Blob Storage Account has been created, and Custom Domain established, we have a little bit of work to do in order to first configure the Blob Storage Account for use. It is easiest to do this using a 3rd Party Tool. There are a couple of main ones out there, the first being from Redgate (who acquired Cerebrata) and you can get a trial version of their software, and also CloudXplorer from ClumsyLeaf. For the purposes of this walk through, I will be using CloudXplorer, so go ahead and get that installed. 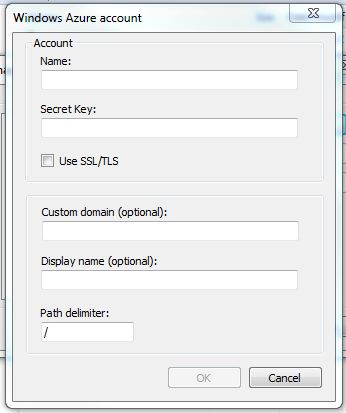 Using the information from step 5 above, enter the details of the Blob Storage Account that we created, where "Secret Key:" equates to the "Primary Access Key" (simply click View button to bring this up) and Name: is the Name of your Blob Storage Account, i.e. in my case gep13wpstorage. In the _Create directory/container _window, enter the name for your container. I went for "myuploads". Now we need to set the properties of the container to allow public access. Right click on the container that you just created and select Properties. 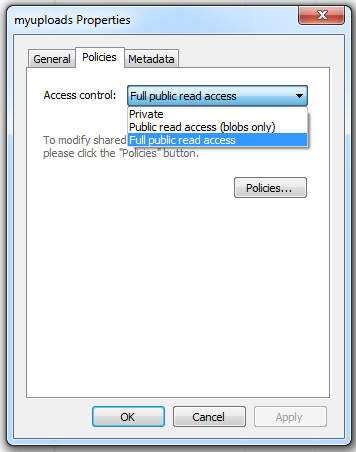 In the myloads Properties window, select the Policies tab and then select "Full public read access" in the Access control drop down list, then select ok.
At this point, you have a number of options to set up your WordPress site to use Windows Azure as it’s repository for static content. 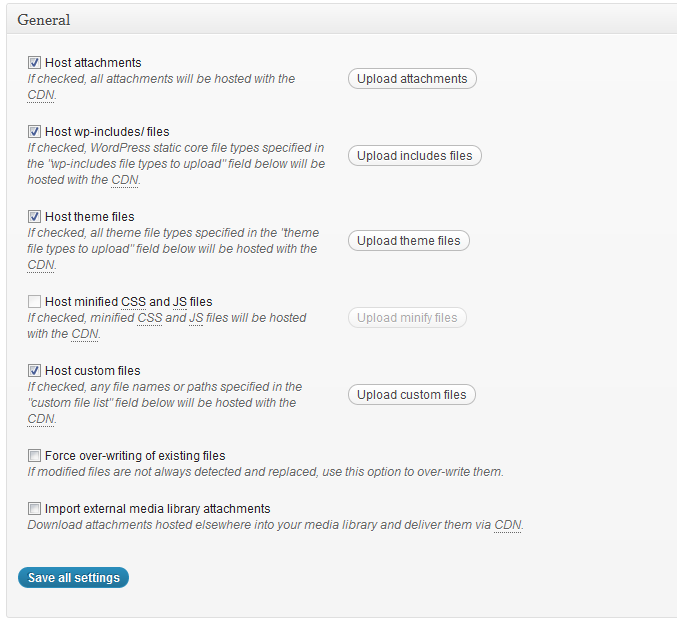 Microsoft have actually released their own WordPress plugin which does just that. If you are interested, you can find this here. I ended up not using this particular plugin. As far as I could see, the onus was on you to manually move the files into your Azure container. Now, this isn’t hard to do, using the CloudXplorer I showed earlier, files can easily be copied into the container, but I wanted something a little more integrated. Including the Custom Domain name which we set up earlier (if you can remember that far back). Then, with all the files uploaded, and W3 Total Cache activated, it will rewrite all of the URL’s for all of your static content to come from your Blob Storage Account. Feel free to take a look and see this in action by right clicking on the view source of this page, and searching for cdn.gep13.co.uk. And that, as they say, is that! If you have any questions, please feel free to get in touch.